Meet Jessie Murphy. 28 years old, 5 feet 8 inches tall, artist, convenient holder of a certificate in criminology. In Quick Walk to Murder, Jessie is starring in her second book, and it looks like that certificate is going to come in handier than her sketch book. Jessie is sort of a snow bird. She technically lives in Massachusetts where she is an apartment manager, but the book takes place in Matlacha, on a Florida island. She comes here because the eclectic village feeds her artist’s soul with its amazing natural beauty. Apparently she first came here with a boyfriend, a story which I can only assume was told in the first book in the series, Through Pelican Eyes . We jump right into the action here, and though author daniels (this is a good place to mention that I absolutely hate the affectation of the all lower case name – but I didn’t notice it until after I read the book) attempts to catch us up with Jessie’s basics, we are definitely missing some big, big pieces. If you decide you’re interested in this series, I strongly suggest starting with the first book. Anyway, Quick Walk to Murder finds Jessie on her way out of town, back to her job in Massachusetts, when a young man is murdered. The Mexican family of the boy does not trust the police to invest in finding their son’s killer (with good reason, the cops here are jerks to the Mexican fishermen) and wants Jessie to investigate. Like she has apparently done before (yeah, you need to read that first book). And thus a cozy mystery is born. Unlike most cozies, the strongest part of this book is the mystery. I didn’t particularly care for Jessie – she’s the annoying type of artistic that can’t keep from discussing art as some sort of sacred gift. She’s supposed to be funky and quirky and charming, but it feels forced. Her romantic interest is a fine enough character, but his interesting and seductive eccentricities are wasted with too little page time. Her best friend is a text book cozy character – loud and pushy and not too bright, but Jessie insists that she’s the best person in the world. I just didn’t see it. So, really, the mystery is well-written (actually very tightly plotted and well-paced) but the characters left me cold, and made it hard to get through to the interesting stuff. daniels does do a nice job describing the natural beauty of the Florida islands as well as the culture of the village and surrounding area, but it isn’t enough to push past the unappealing lead. 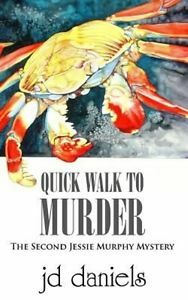 Quick Walk for Murder gets 2 stars, one each for the well plotted mystery and the well described setting. If you’re really into that part of the country, that might be enough for you – but I can’t recommend it.